Wild Plant in kili trek. 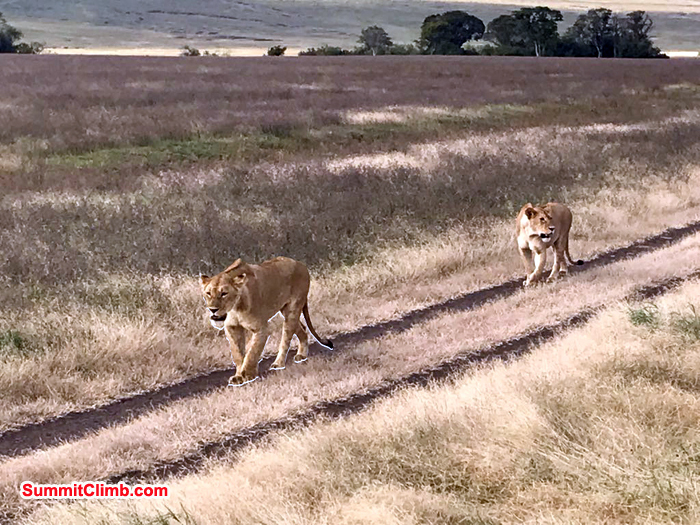 Please click one of the links below to view that section of our Africa Expedition daily itinerary or scroll down. Note: This is a proposed schedule, which has been developed through previous trips. The actual itinerary of your trip can differ depending on such factors as weather and local conditions. For example, the trip may finish earlier than these dates, or we may need every single day of the schedule. Thank you for being patient and flexible when coming to a foreign country like Kenya and Tanzania. 2) Drive 3 hours to Rongai Gate, then start walking to Simba. Camp at 2650 metres/8700 feet (3 hrs). The walk is initially through plantations, then rain forest and finally bush country. Dinner and overnight at Simba Camp. 3) Trek to the 2nd Cave at 3450 metres/11,300 feet, (3 hrs). A gentle day trekking through bush and heather. Dinner and overnight at Cave 2 campsite. 4) Depart after breakfast for a gentle rising traverse through moorland over several ridges to Kikelewa Caves, 3600 metres/11,800 feet (3 hrs). 5) Depart to Mawenzi Tarn Hut, 4330 metres/14,200 feet (3 hrs). Lunch, dinner and overnight at Mawenzi Tarn Hut. 7) Trek to Kibo Hut for lunch, dinner and overnight. 8) Very early start for the summit on steep scree up to Gillman's Point (5681 metres/18,630 feet), which is on the crater rim. Continue around the rim (which will take about two hours) to Uhuru Peak (5895 metres/19,330 feet), the highest point in Africa. Descend to Kibo Hut for tea and biscuits or soup and then down to the thicker air and warmth of Horombo Hut. Day 1 Arrival by flight, arrival in Nairobi and drive to the hotel, overnight / breakfast. (Photo right by Cheryl Goodwin - Good2GoPhotography.com (all rights reserved) : Our team member Peterson enjoying the view of Teleki Tarn. Day 2. Full day to relax, for the visit of Nairobi (national park, Bomas), last purchases (snacks etc.) and climbing training, especially. in Lukenya, about 1 hour drive outside of Nairobi. Dinner in the evening with tour meeting and meeting of all group participants. Days 3 and 4. Head off along the trekking route. Along the way, mountain guides and participants of the climbing trip will discuss the ascent and practice. Winter: We climb to the Austrian Hut and from there we can climb the Point Lenana (4985m). Summer: From Shipton's Camp we can do a training tour or try the Batian ascent. Day 7. 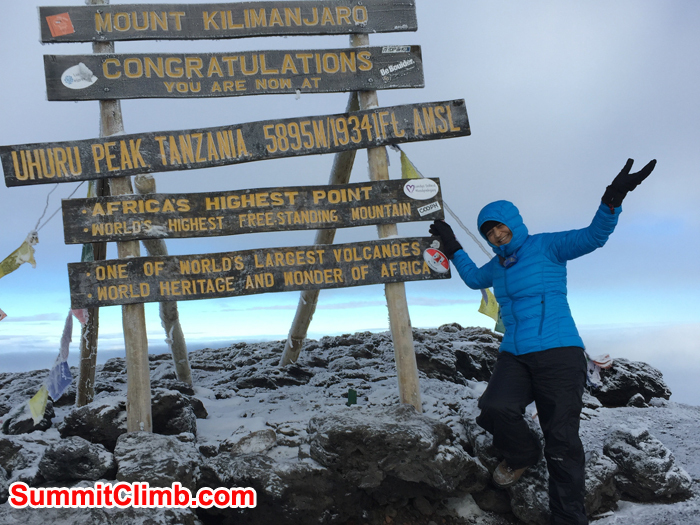 Mount Kenya Ascension: Climb the Batian (5199m). We get up early in the morning to be at the start of the route at the first sunlight. (photo right: Kili Summit). Winter: The ascent along the Nelion normal route just starts, so we quickly gain altitude. Past the MacKinder's Gendarme, the bowl length lasts, then we follow block terrain with two 3-point to the summit of the Nelion (5189m). For the Traverse to the Batian we have to abseil suspended in the gap (Gate of the Mists), then climb a 3-ridge to the Batian (5199m) - depending on the circumstances then crampons are needed. To descend from the Nelion we roped off over the drilled Austrian rescue line. Summer: The entry-level length offers a key pitch (UIAA 4) and is the first challenge with clammy fingers. Then it's easier through a couloir to the amphitheater (until then there is a considerable risk of falling rocks), then over the Firmin's Tower to Westgrat. The ridge goes past Shipton's Notch to the main summit (Batian, 5199m). The descent is along the ascent route by abseiling and climbing. 1) Optional: extra day in Nairobi if you feel it's necessary or go on safari. Day 1 - Arrive in Tanzania. Arrive in Arusha, Kilimanjaro International Airport, then transfer to Hotel for overnight stay (nights / F). Day 2 - Kilimanjaro Trekking - 1.Rongai camp From the hotel ride on a private bus through a region with lush vegetation, coffee and banana plantations on the north side of Kilimanjaro. By forest area we continue to Nale Moru, the starting point for the ascent. A narrow path along the corn and potato fields into forests and with a little luck we can observe wild animals there too. Finally, we leave the forest belt and reach the camp in the transition from forest to moorland near the Rongai cave. Journey time approx. 3 hours walking time approx 3-4 hrs. Overnight tent / VP (2600m). Day 3 - Kilimanjaro Trekking - Kilelwa stock Equally, the path pulls up to the second cave to around 3450m, always show up in the formed of lava landscape small caves. After lunch we leave the main path and walk across the moorland towards Mawenzi. Finally, we reach the camp near the Kikelewa Caves in the sheltered valley a fascinating backdrop. Walking time 5-7 hours. Overnight tent / VP (3600m). Day 4 - Kilimanjaro Trekking - Mawenzi Tarn Today's stage is very steep, but short. Grass covered slopes lead in a high alpine, virtually no vegetation zone. The fantastic panoramic view rewards the effort of the climb to camp near the Mawenzi Tarn, a small lake at the foot of the dominant rock spiers of Mawenzi, the 5149m high neighbouring Kilimanjaro. Walking time 3-4 hours. Overnight tent / VP (4300 m). Day 8 - Kilimanjaro trekking - Descent Despite the long but not very strenuous descent we have time to admire and photograph the landscape and flowers. Back at the Marangu Gate it's time to say goodbye to guides and porters. Then we drive to the hotel and you will be rewarded for the summit success with a certificate of the National Park. Walking time approx 3-4 hrs., takes about 1 hr., Hotel (Nights / F).